“Reframe” and “Pan and Scan” are synonymous with one big feature in v7 – the ‘handling’ of resolutions above HD. By handling, I mean the scaling and shifting of video frame sizes over HD into a smaller HD frame size. In other words, a selective crop of your raw frame size into a 1920×1080 or 1280×720 frame size. Previously, Media Composer could only work this mojo with RED footage – however, now the feature has been expanded to address the growing number of cameras that shoot above HD. 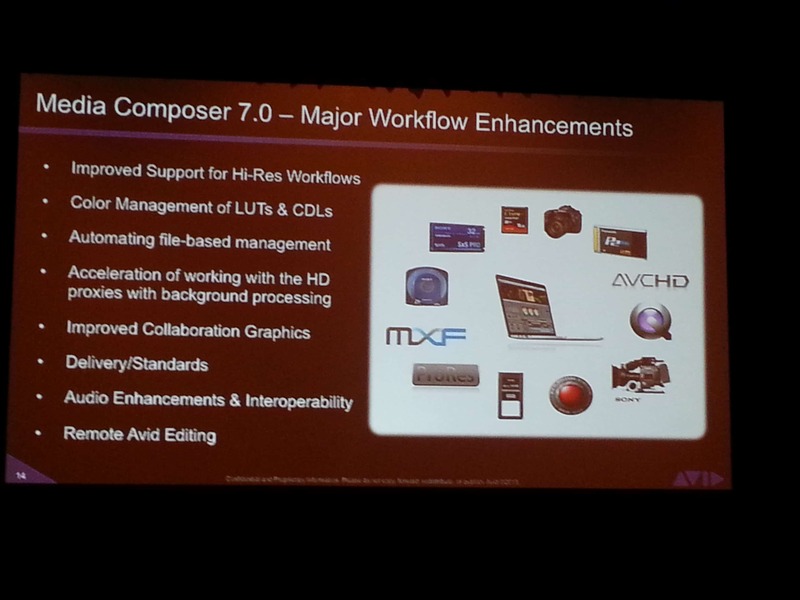 What this dances around is the continued lack of resolution independence within the Media Composer product line. This necessitates a traditional offline / online workflow for anyone wishing to finish at HD+ resolutions. Truth be told, the need to finish at HD+ resolutions is often overrated – most web and broadcast outlets aren’t accepting it, most home players and TVs can’t handle it, and unless there is some substantial money for a larger theatrical release, most festival theaters or projectors can’t show it natively. That being said, future proofing is always a consideration – finish larger for a better product in the future. So, weigh the pros and cons – do you really *need* to finish above HD? That PSA aside, it’s disappointing that the undisputed leader in digital editing for Hollywood’s biggest films is still locked at HD. Wouldn’t it be great if Avid already had software that supported resolutions over HD natively? When dealing with these newer cameras that shoot above HD, they often shoot in different color spaces. While rec709 is pretty much the default standard, however shooting RAW or LOG C (among others) is becoming more and more common among those shooters who need desire greater color latitude in post. These looks usually give a visually milky or otherwise unpleasant experience, but allow for more latitude in color grading afterwards. While this is great while color grading at the tail end of the project, it’s always been a massive pain for those editors who need to take this unpleasant looking footage and not only cut with it, but generate a cut people can watch. Normally, a D.I.T. will create media the editor can cut with that has a LUT (look up table) applied, but frequently the budget (or time) does not allow for this. Enter the Editor, who must apply some kind of color effect to the raw footage to approximate the look the DP was going for. This involves rendering, creating new media, and often the color is not exactly what the artist in residence DP is jonesin’ for. With Media Composer 7, 1D / 3D LUTs and CDLs can be applied to your footage. LUTs have many standards, and thus the LUT the DP has created can be added to the footage to give editorial and screenings the look production was going for. This then can be baked in, or removed if the project goes to another color grading solution. Those who shoot and/or edit RED and Alexa (among others) will be beyond thrilled. As an added bonus, there is a metadata handshake between the AMA linked footage and Avid, so Media Composer knows what LUT should be applied. It’s the little things. Background Transcoding, Consolidate and Copy: Let’s be clear about this. This is not background rendering. This is not background exporting. This are watch folders with user customizable profiles enabling the ability to import/transcode media into various formats for use with Media Composer, as well as consolidate or move media. Background rendering is planned for the future – however with no ETA. To assist, Media Composer presents a UI of the progress of the jobs to be accomplished in the background for the user to track progress, as well as cancel, pause or prioritize items. This is the first step (much like AMA for XDCAM in v3.5) in creating a robust framework which to expand upon in the future. As a side note, for those efficiency speed demons out there – there is no frame chase….the file must be fully transcoded before you can begin to edit with it. This is a technology borrowed heavily from Interplay Sphere (if you haven’t seen our slide show on on our Avid NAB 2013 page, or our current webinar – you’re missing out). All this is possible via the new Dynamic Media folders in Media Composer 7. These folders (outside of the Avid MediaFiles folder) are also managed by Avid, and even have the database files we’ve come to love/hate. These folders can reside local, on Avid shared storage, or any other 3rd party storage. Users will continue to debate the amount of attention by Avid on the massive implementation of a robust stereoscopic feature set for quite a while. It was a risky horse to bet on. Looking ahead, one sure bet is the move towards distance collaboration for editorial. Interplay Production with Sphere is one of the best implementations of these distance collaborative workflows. With Media Composer 7, Interplay Sphere is enabled and built into the software, so when you decide to make that next leap into distance workflows, Media Composer can be enabled to do so. Avid continues to further blur the line between audio and video (finally, eh?) with continued addition of features from their Pro Tools juggernaut. One can certainly argue that having similar toolsets make the move to Pro Tools less daunting – acclimation time is reduced. Adoption rate will be higher. That’s one way to look at it. Symphony: Now an option for Media Composer users as a license upgrade – the feature set is already included with the Media Composer installer. XAVC is now native within Media composer, as is adherence to the AS11 spec. Avid now has a Thunderbolt (Intel Eagle Ridge Thunderbolt chip) to PCIe adapter device that supports Mojo DX connectivity to Mac Minis and iMacs. No, Nitris DX is NOT currently supported. Sphere? WOW. Too much to mention. Need another blog post. Check out http://www.keycodemedia.com/Avid-Products/avid-and-key-code-media for all of the features and pictures from the NAB 2013 meeting. Avid DS: Like many of the cactuses here in Nevada. Doesn’t get much attention, yet still seems to serve a purpose. Ya know, they’ve had some really nifty features for quite a while. Resolution independence. Useful tracking and compositing tool. DPX interop. Boy, I’d love to see some of that in Media Composer or Symphony. I am not aware of any new ability for MVC files to be played natively inside MC in v7, unfortunately. That’s the only way right now. Yes – I’ve done this in MC 6 and 6.5. Just need to buy the MVCtoAVI software. Works fine. Quality is a slight bit degraded – but that’s the tradeoff with MVC.